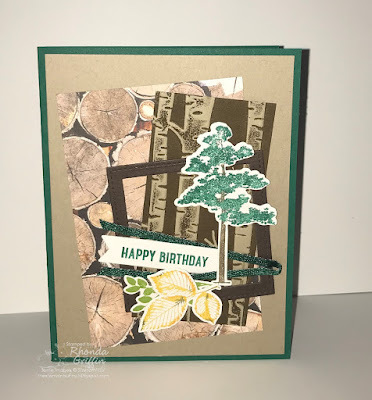 Design Challenge #7 was inspired by page 48 of the new Stampin' Up! Annual Catalog. I think it is a fun way to use designer series paper for the designer series paper sale in July too, so I may have to make another card! Please try the sketch, and if you do, post it here: http://myinkyfriends.blogspot.com/ to enter the contest! For this card I wanted to try a masculine and cozy feel, so I used the Rooted in Nature set with the Wood Textures 6" X 6" Designer Series Paper and the Woodland Textured Impressions Embossing Folder. The Metallic Ribbon combo pack has a Shaded Spruce ribbon that I think adds a different texture. I also used all the Stampin' Up! browns: Soft Suede, Early Espresso, Sahara Sand and Crumb Cake. I used the ink to Textured Impressions Embossing Folder technique to highlight the Woodland folder and create texture and interest merely by putting the Soft Suede inkpad directly onto the folder and running it through the Big Shot. I cleaned the embossing folder immediately with first a dry paper towel and then soap and water.